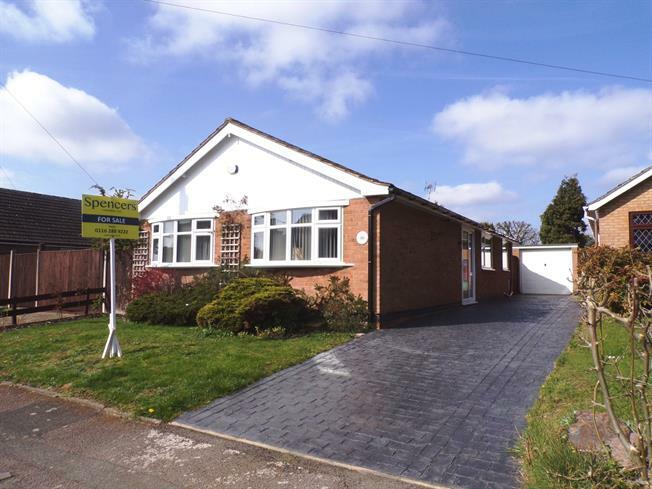 2 Bedroom Detached Bungalow For Sale in Wigston for Offers Over £290,000. Perfectly positioned in a desirable cul-de-sac location, This beautiful detached bungalow offers spacious accommodation along with tasteful internal decor and hi quality fittings. From a spacious hallway you have a well proportioned lounge with dining area, French doors opening on to the garden, modern breakfast kitchen, two double bedrooms the master having ensuite, a newly fitted, fully tiled, impressive family bathroom with under floor heating. Substantial and private rear garden, driveway and single garage. UPVC sliding double glazed door, opening onto the driveway. Radiator, built-in airing cupboard, wooden flooring. A wonderfully spacious living room with dining area, upvc window to the side aspect. UPVC sliding double glazed door, opening onto the patio. Radiator, electric fire with surround. Double aspect double glazed uPVC windows facing the rear and side overlooking the garden. Radiator, laminate flooring. Roll top work surface, wall and base units, inset ceramic sink, integrated oven, gas hob, overhead extractor, integrated dishwasher. Upvc obscured window to the side, Heated towel rail, vinyl flooring. Low level WC, single enclosure shower, wash hand basin. A stunning refitted bathroom Double glazed uPVC window with obscure glass facing the side. Heated towel rail, tiled flooring with under floor heating. Low level WC, square P shaped panelled bath, rainfall shower, vanity units and wash hand basin. To the front of the property is a cobblecrete driveway providing parking for several vehicles, leading to a single detached garage with up and over door power and lighting, lawned front garden with mature shrubbery. Side gated access leading to the rear garden which is incredibly private enclosed by timber fencing, rear patio and further seating area, substantially lawned with surrounding borders.